You have just received your Mosin-Nagant rifle, a Винтовка Мосина or Vintovka Mosina, developed in the 1880s and used ever since. 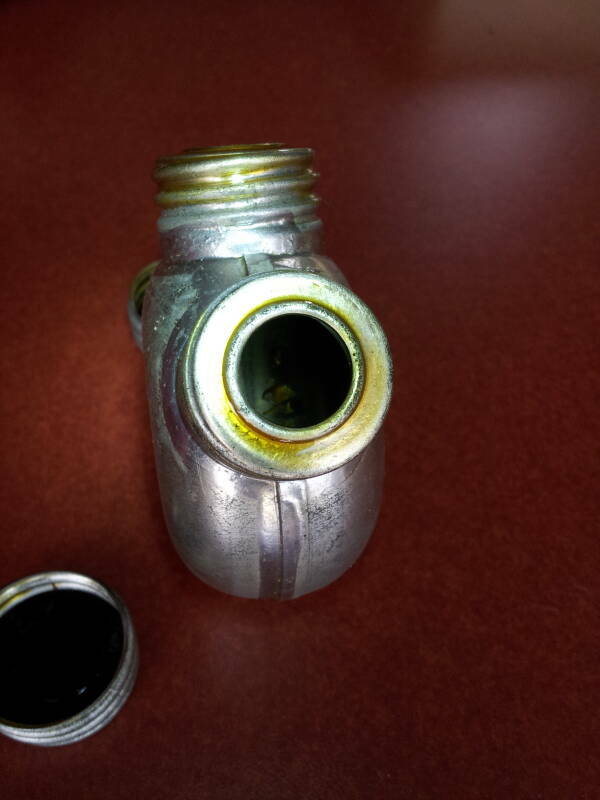 It's accompanied by a cleaning and maintenance kit with a mysteriously labeled oil can. Let's investigate! 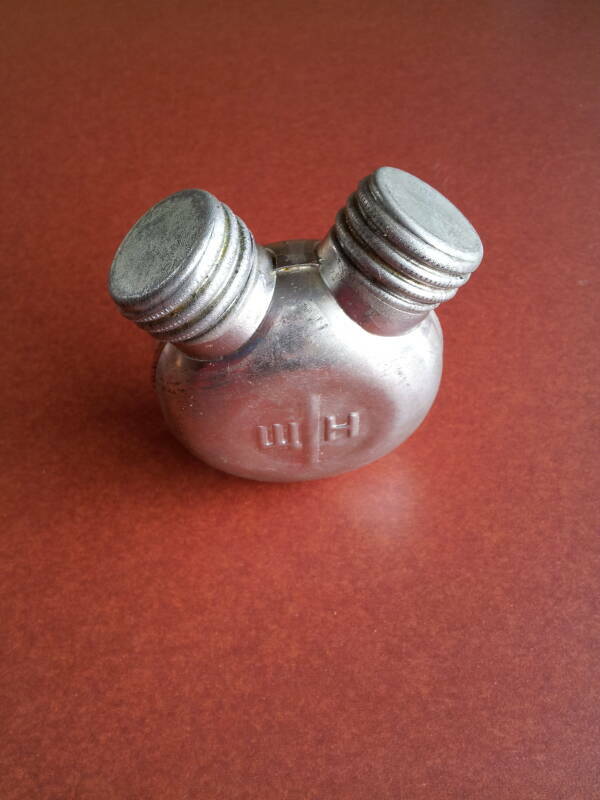 Once we figure out the markings we realize that the cleaning and maintenance kit is official Soviet military issue, and the two-compartment can is clearly marked for oil on one side and solvent on the other. OK, this may not be terribly clear to you now, but this page will explain it! 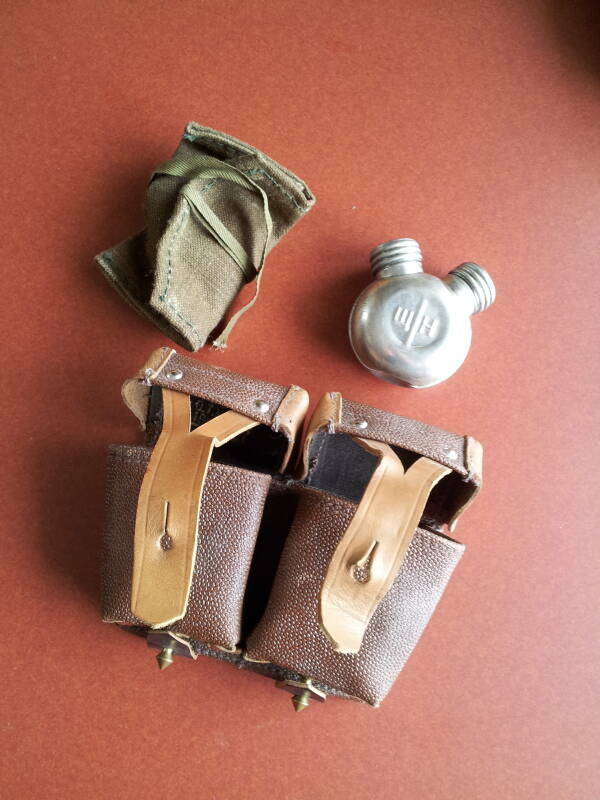 The cleaning and maintenance kit is contained in a pair of pouches that can be carried on a belt. 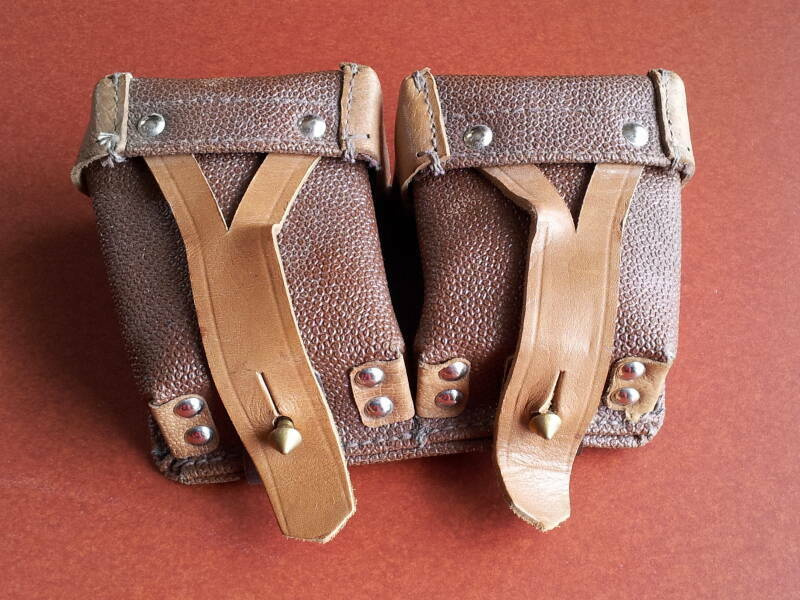 Leather straps are pulled over studs to hold the pouches closed. When you open one of the pouches you will find that the surplus dealer has put the aluminum two-compartment can into a zip-lock bag. Or at least you hope that is the case! Otherwise your pouch will be partially filled with cosmoline. Everything is packed with cosmoline, whether it really needs it or not. 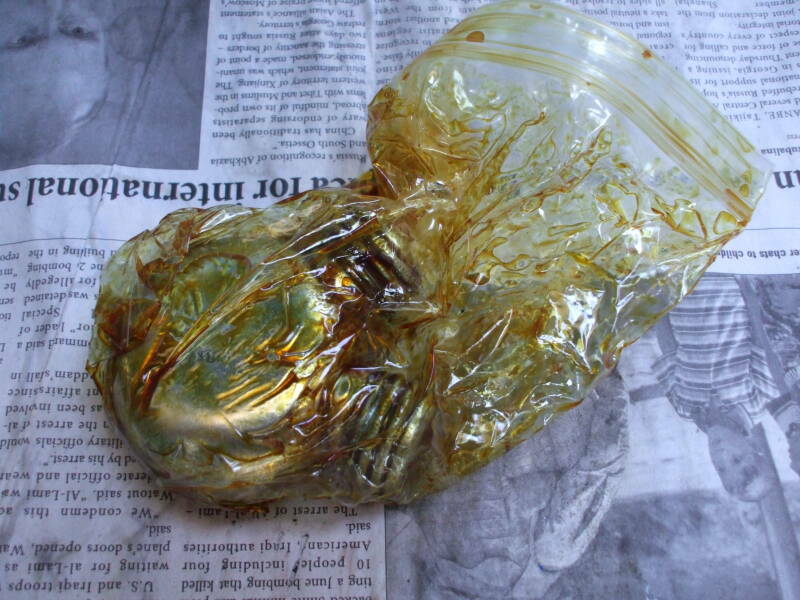 Once you clean off the cosmoline with brake cleaner or similar, the pouches and their contents will look like this. 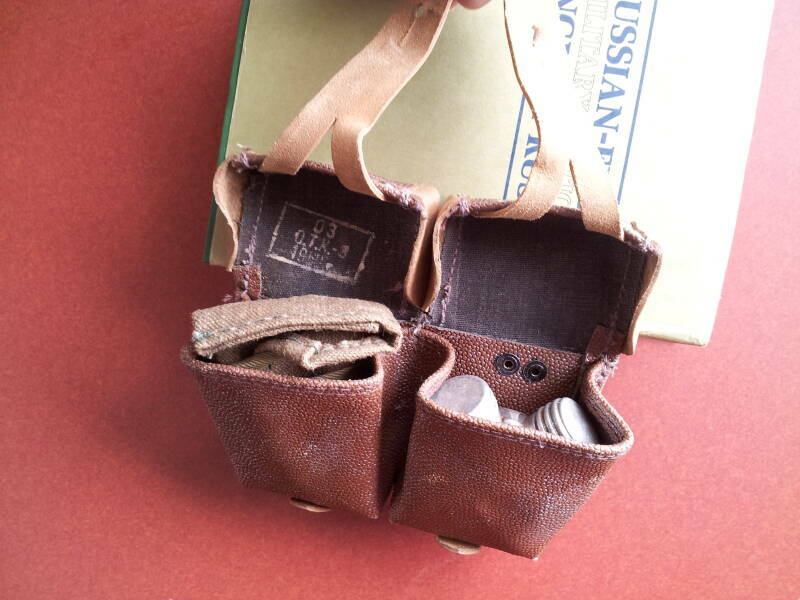 The interior of one pouch cover is marked ОТК along with a few other details including year of manufacture of the kit. 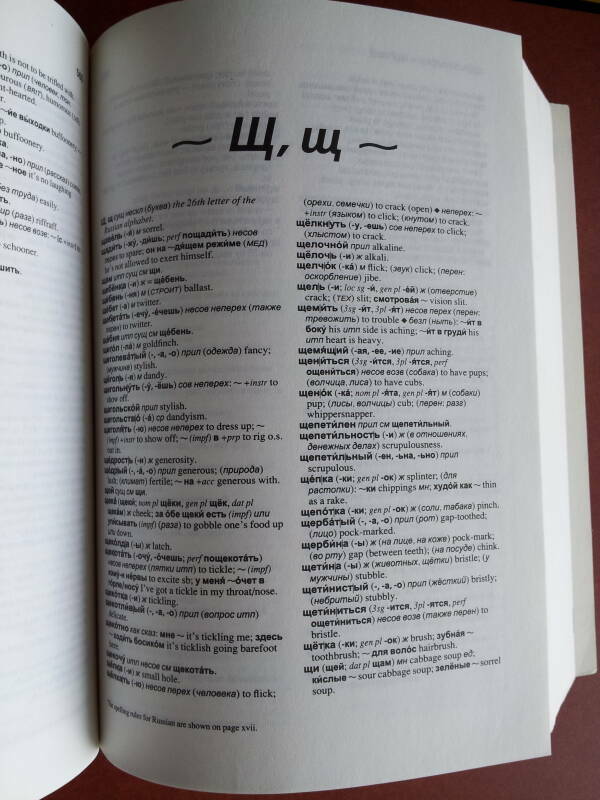 As explained here, Cyrillic ОТК (which is coincidentally corresponds to the Latin letters OTK) is a Russian acronym for Отдел Технического Контроля or Otdyel Tekhnicheskovo Kontrolya. It means that the item was manufactured to military specifications in the former Soviet Union or another Warsaw Pact nation. 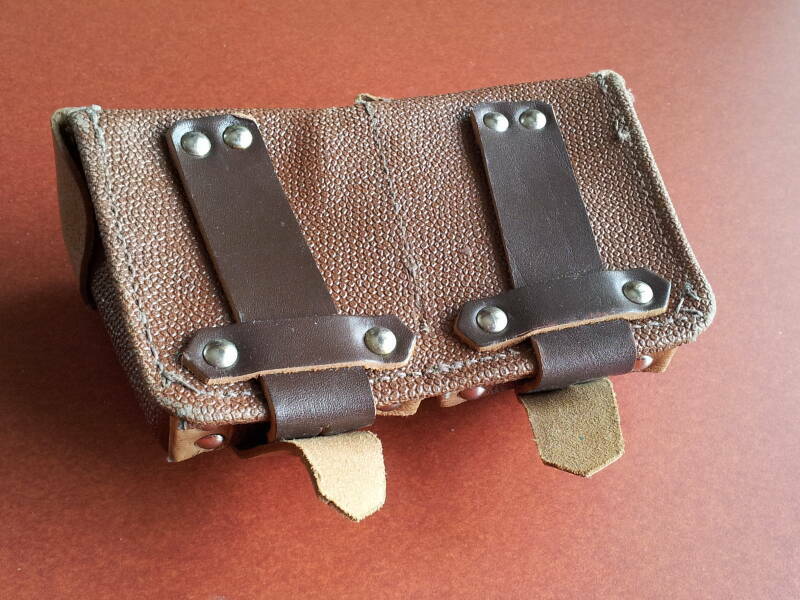 One side contains a green cloth pouch, closed with something similar to a cotten shoelace. It holds a kit of maintenance and cleaning tools. The cleaning rod itself is inserted into the stock below the barrel. 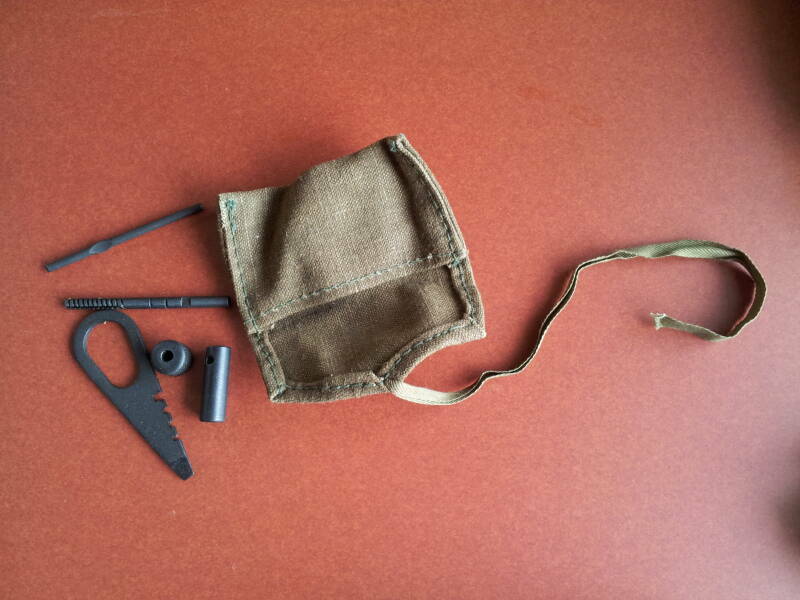 This kit includes a tip with ridges that can drag a square of cleaning cloth through the bore. 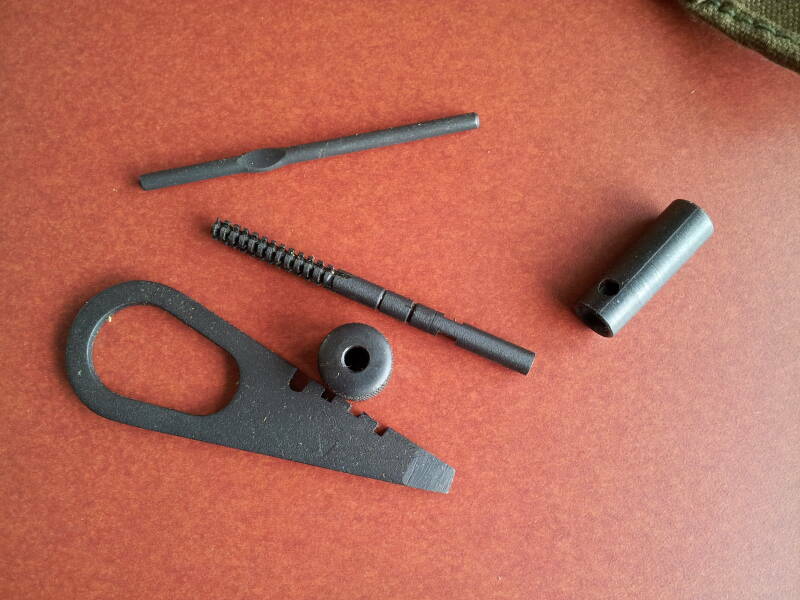 The flatted rod forms a T-handle by passing it through a hole on the end of the cleaning rod. The larger tube, seen end-on here, is a bore guide. The largest tool in here can be used for various cleaning and maintenance tasks. 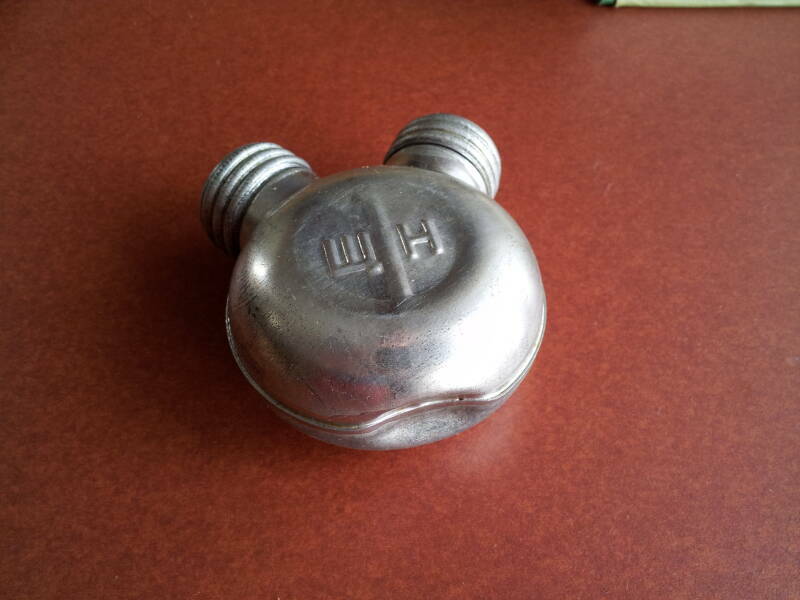 The item in the other side is a two-compartment aluminum can. 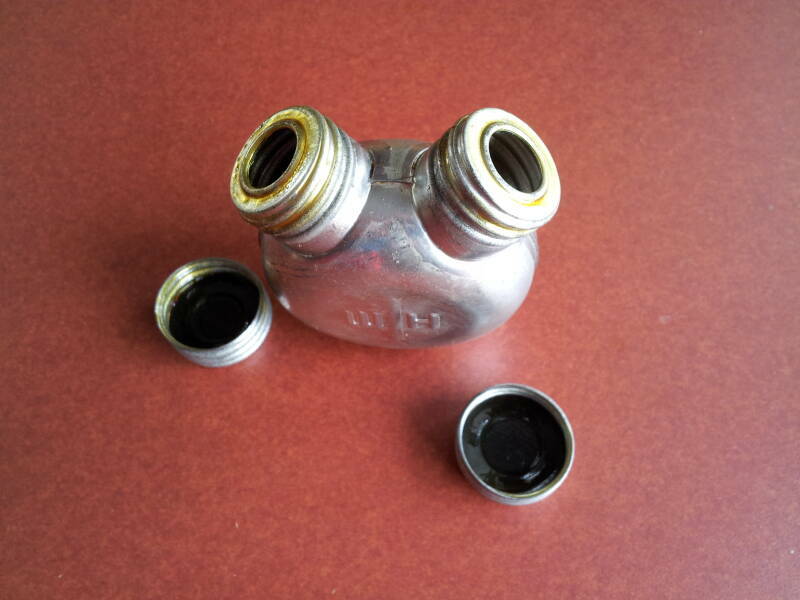 It is divided down the center and each side has a cap that can be screwed off. The interior will also have cosmoline in it. Once you finally get all the cosmoline cleaned out, it isn't immediately obvious what you are supposed to do with the two compartments. 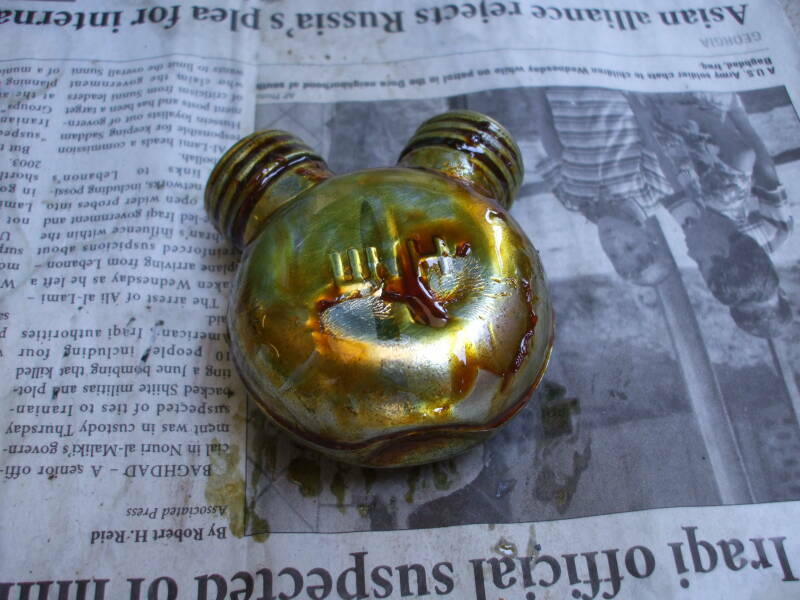 Н, equivalent to Latin N, stands for нефт or nyeft', meaning oil. Let's see if we can figure out what Щ means. 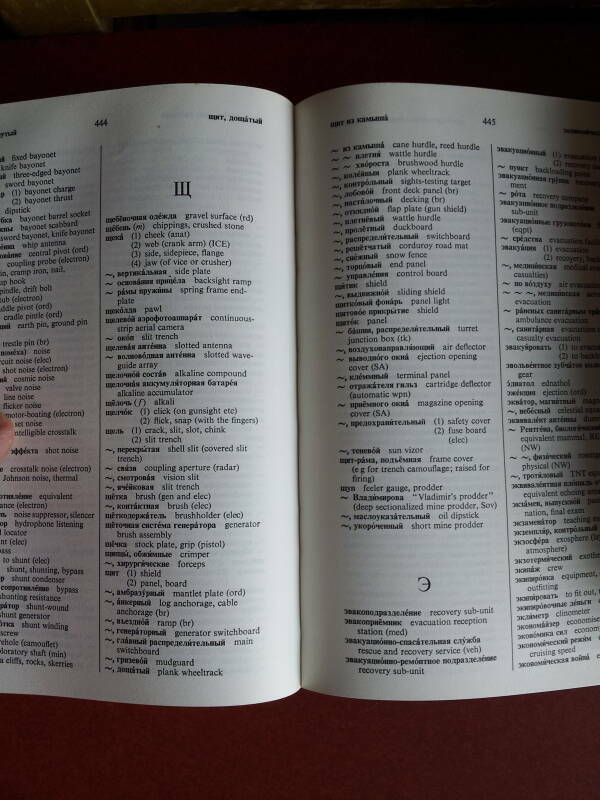 It's equivalent to Latin shch. There aren't many words starting with Щ. It's the consonant in the middle of "Krushchev" and is pronounced more or less like the middle of "fresh cheese." 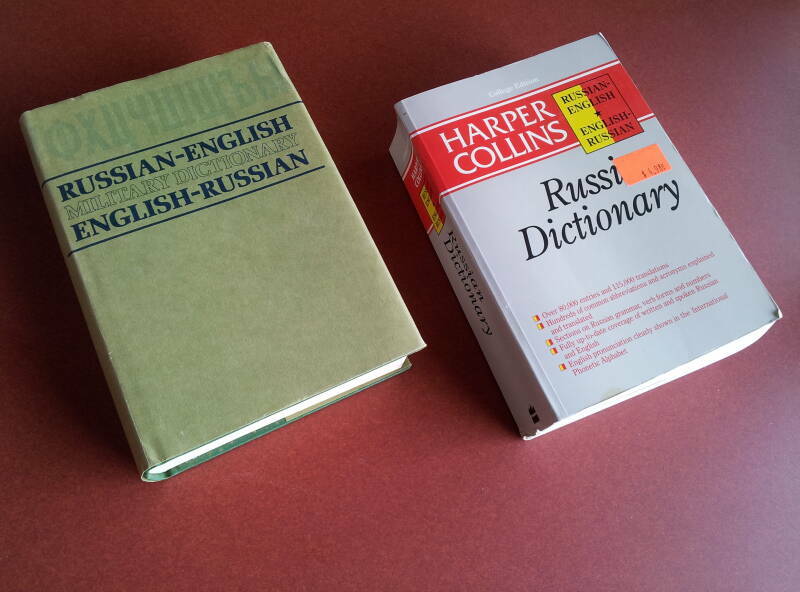 Here are two Russian-English / English-Russian dictionaries, one general-purpose and the other specializing in military terms. 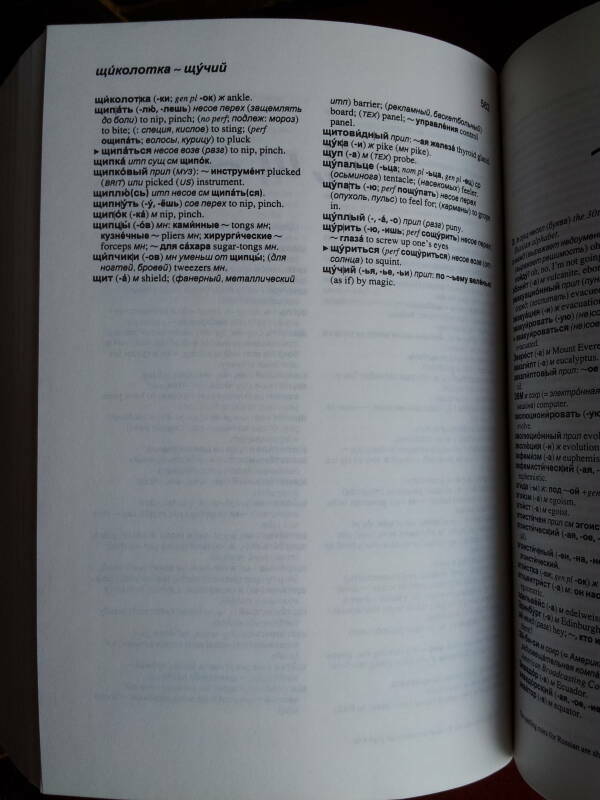 Here are the two pages for Щ in the general-purpose dictionary. There's nothing very obvious in the list of words starting щ, although looking back at this list later might show something that could have been a hint. 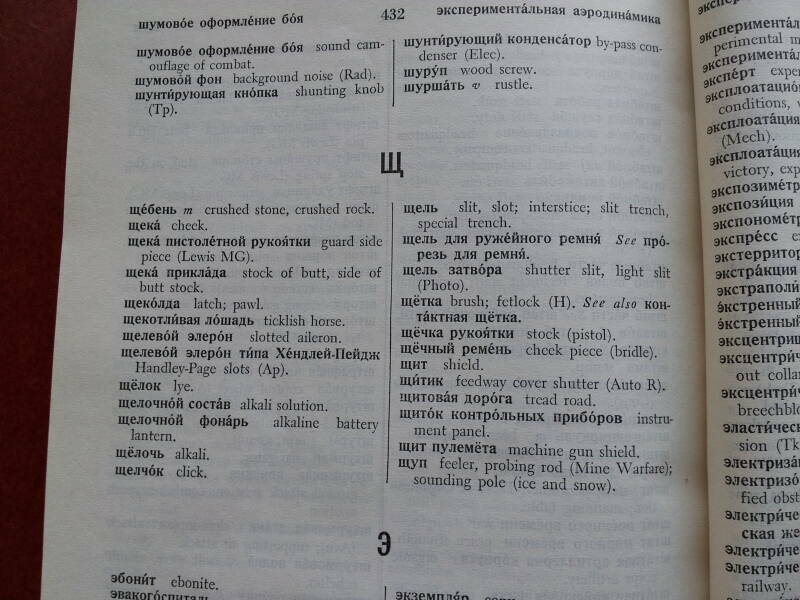 Let's move on to the military dictionary, where the words for Щ fit onto one page. The answer is here, do you see it? 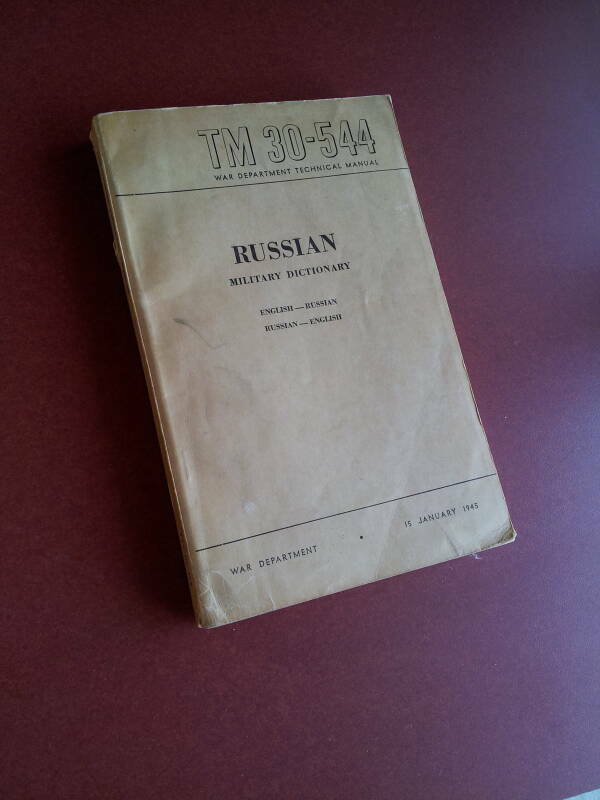 U.S. War Department training manual TM 30-544 RUSSIAN MILITARY DICTIONARY gives us the answer. It was published on 15 January 1945, as the Allied armies were advancing on Germany from both east and west. It's alkali solution, Soviet cleaning solvent. If you're going to be firing a Mosin-Nagant, you really should be wearing traditional Russian portyanki.